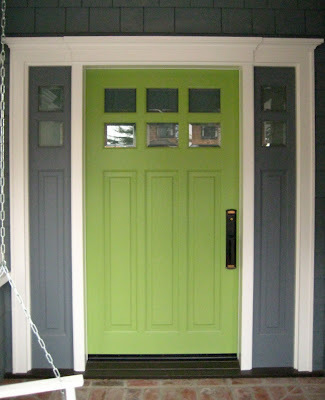 Gotta love this lime twist on the classic craftsman red door. This is a nice and wide Simpson 7860 three panel, six lite front door with matching Simpson 7260 sidelights. I think those sidelights to the left and right of the door looked better in white, but after much debate, we were asked to re-paint them to match the Boothbay Blue of the shingles. The thought was that the door looked too wide with that much white on each side of the green. The header crown is stepped above the center door, a small detail with big results. 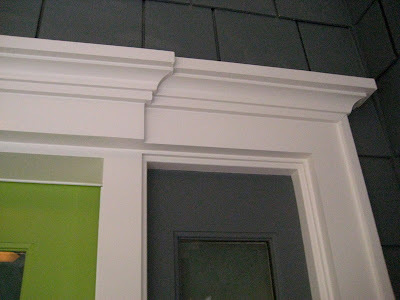 This trim style is repeated on the adjacent front windows. The inside of this front door is so fresh and so clean in white on white. The small windows bring light into the entryway, while their height maintains the privacy from the busy street out front. The trim is the same as the pocket doors here. All in all, a fabulous front door, inside and out! 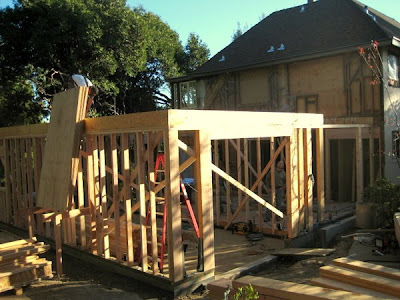 The second story is up! This floor is the master suite addition, guest bedroom, new guest bathroom, and a remodeled kids' bathroom. 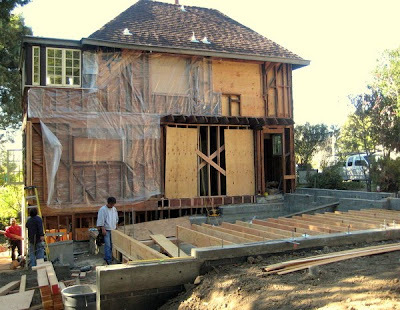 The challenge with every home remodel is the intersection of new and old. On the first level, that trouble spot was aligning the floor of the new structure to the precise height of the old (which is, of course, not level) because we're going to have hardwood that patches in to one continuous floor surface with no transitions. On this level, the challenge is a long hallway that starts in the old house and bisects most of the length of the new. The old section of hallway is not completely parallel to the exterior walls. We can't angle the new hall to match or you'll see crooked cuts in the bathroom tile floors, and a jog in the wall just won't do. We decided to cant the front exterior wall out 3/4" to loose some of the angle. 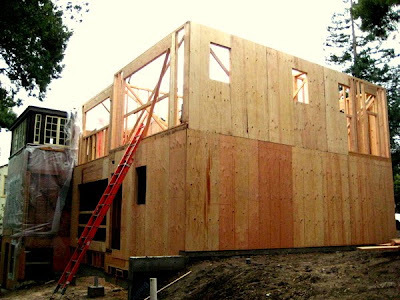 That much can be absorbed by the plywood and stucco. Then we framed the new hall walls parallel to the exterior walls and a hair wider than what we need them to be so the sheetrockers can float more mud at the joint of the two sections to give the impression that it's always been one long fabulously straight hallway. At the base from top down, you see the dramatic trim legs again, and they abut a larger plinth block (made on site). The plinth block is thick enough to allow the baseboard a place to die into. You also get a sneak peek here of the wide plank, dark stained oak floors. Put it all together on a pair of pocket doors and you get a picture of perfection. The interior doors are T.M. Cobb F-30 3-panels in fir. Simpson has a similar door here. 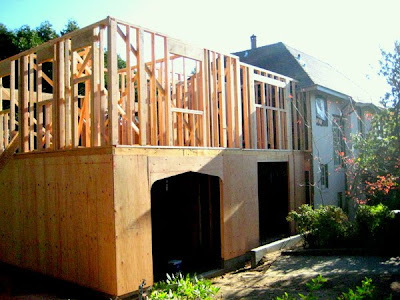 Check back for trim details at the stairs, crown moulding, and box beams. Here are the pretty things you've been waiting for! 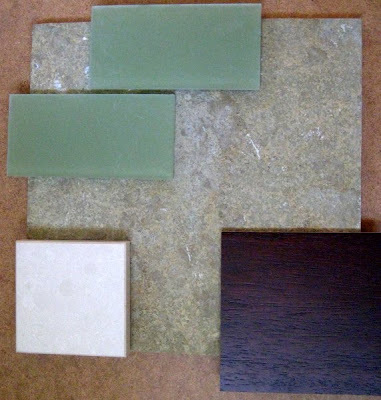 Material samples provide a glimpse of what the remodeled bathrooms will look like in our English Tudor. 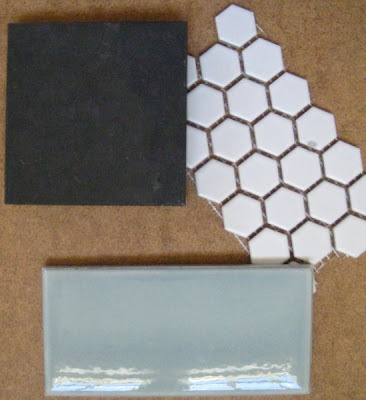 This tile combination for the master bath feels fresh and spa-like. Love it! This layout for the kids' bath is great for any age. The hex floor tiles give a period vintage feel fitting of the house, while the frost blue subway tiles keep it modern and clean. Let's have it for walls! After a month of slogging around in the mud and concrete, it feels great to roll out some joists and have a floor to stand on. 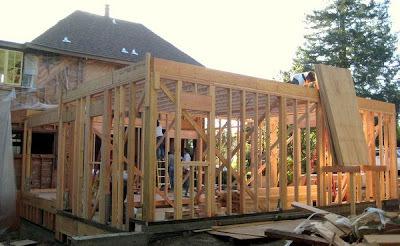 The best thing about framing is how fast it goes -- big, dramatic change every day! The first floor walls are just about complete and the second floor walls will be up by next week. What you're looking at here is the new garage addition on the outside and kitchen and family room addition closest to the main house. Second floor pics will be here before you know it.